Our Sunday Morning Worship is held at 10.30 am. Our church celebrated its 75th Anniversary in 2009. Our Bible Study Group meets on the first and third Thursdays of each month at 2.30 pm at Benwell House, Cox Green Lane, Maidenhead. A Toddlers Group meets every Thursday at 1.30 pm. Rainbows and Brownie Guides meet every Thursday evening. A thriving First Steps Pre-school Group, which celebrated its 25th Anniversary in June 2013, meets Monday - Friday during term time, from 9.30 am - 12.30 pm. Except on Thursdays, it is followed by a Lunch Club until 1.30 pm. An ecumenical team, including six of our Church members, is actively engaged in the Open the Book project. This takes place one morning each week at an assembly at Woodlands Park Primary School. This is an exciting and important outreach activity with a lot of participation from the children. It involves telling a scripted bible story, some "elementary" character acting and a relevant conclusion — all within ten minutes! If you would like to know more about Open the Book, visit its website. For the benefit of the children, and especially the Pre-school Group, extra facilities have been added. Part of the Church house garden has been turned into an outside play area, and a shed has been put up to store equipment and play items. The church has completed a fund-raising project spanning many years supporting AIDS orphans in Kenya. In partnership with St Mary's Anglican Church, White Waltham, and beginning with an event to celebrate the Queen's Jubilee in 2012, the church has run a series of Community Fun Days for the residents of the Woodlands Park estate. The events so far have been most successful (in spite of the constraints of the weather)! The events are held on The Green in the centre of the estate. All the activities are free, from the climbing wall to face painting and tea and cakes. More events are planned for the future with this exciting ecumenical initiative. Although our members are getting older, we continue to be open-minded to new ideas for mission and outreach in the pursuit of spreading the love of God in our community! Methodism came first to the South / South West of Maidenhead, not to what is now Woodlands Park, but to Cox Green where a Chapel was built in 1875. However, it was never a strong society. In 1911 the building was sold to All Saints Church, and was established as the daughter Church of the Good Shepherd, until, in 1977, the congregation moved to the Cox Green Community Centre. 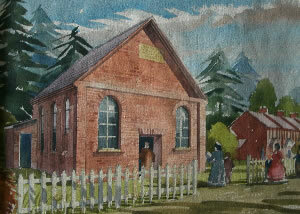 This picture, painted by Maidenhead artist Jack Widgery, shows Cox Green Chapel c 1900. Heywood Park is about 4 miles from the centre of Maidenhead. It was originally part of Windsor Forest. Heywood, in White Waltham, was a tranquil, rural hamlet for many centuries. It is about a mile away from the Bath Road, along which John Wesley rode on numerous occasions, though it is not thought he visited the village. After the First World War, Heywood began to grow but still kept its charm and was a safe close-knit community … until two gruesome murders took place in 1929 and 1932. The village was shunned and builders could not sell houses. An imaginative change of name to Woodlands Park, with Heywood Avenue (scene of the second murder) renamed Woodlands Park Avenue, led to a change of fortune, with the village growing to over 250 houses by 1934. That year, James Slatter, a builder and Methodist Local Preacher, together with Thomas Abercrombie, the Sunday School Superintendent at Queen Street Methodist Church, Maidenhead, purchased some land for £160. Although there was only one Methodist living in the village at that time, they saw the opportunity for mission in the village. The first Trust was formed on 19th March 1934, with the foundation stones of the new Woodlands Park Methodist Chapel laid on 2nd August 1934, including one by the Superintendent Minister's wife, Mrs T Caddy. W H Slatter & Co Ltd carried out the construction work for £750 plus furnishings. The Sunday School chairs were loaned by Littlewick Green Chapel. The building was seen as the first stage of a larger project, and hence positioned at one side of the plot. Work finished on time, and the church was opened on 17th September 1934. Although the adults in the village did not attend, Sunday School attendance reached 91, with 7 teachers, mainly from Maidenhead. The debt was cleared in 1938. With little interest shown by the village people, a mission committee was set up in 1939, but services dropped to one evening a month, and in 1941 permission was given for the Women's Voluntary Service (WVS) and a children's clinic to use the building. After the war, with only the Sunday School and the Children's Clinic using the premises, the possibility of closure was considered and rejected. In 1948, when accommodation was scarce and many people were squatting in deserted army and air force camps, the rear part of the Church was converted to a bed-sitter. Mr and Mrs Maurice Titheradge took up residence in April 1948. This led to the decision to build a house on the vacant part of the plot. Weekly services were restarted, as was the Sunday School. The Titheradge family moved to Cippenham, but Maurice cycled over to preach occasionally, and the Maidenhead Mission Band carried on the work. By 1956 the church was struggling again, and the Trustees considered offering the premises to another denomination. However, in 1957 Mr Alan Kempton was asked to form a team to find ways of reviving the work. A new Trust was formed, the premises were redecorated, and a big At Home party was held just before Christmas with the whole village invited. In 1958 the Church was registered for Solemnisation of Marriages. The question of the spare land resurfaced, and two houses were built at a cost of £3,444. In 1962 High Street Maidenhead took over the debt to save Woodlands Park the bank interest charges. During the 1960s, members changed, with Mrs Grace Davies taking on the leadership of the Sunday School. A gift of a communion table and chairs was received from Slough Central Hall, a new Trust was formed, the collapsing leaded windows were replaced, and the membership stood at 10. In 1970 Mr Chris Lelliott presented a master plan for future improvements to the building, and the kitchen was improved two years later. The outreach of the Church grew strongly, a Ladies Friendship Club was formed, there was a lively Sunday School and a modest evening congregation. A local playgroup started to use the premises five mornings a week. The need to make better use of the premises led to a scheme to turn the building round. A loan of £2,500 from High Street Maidenhead enabled the building to be altered for side access, central heating, a suspended ceiling and a new sanctuary. 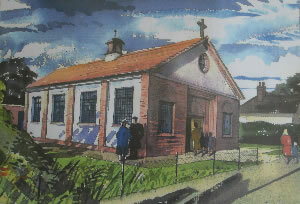 The Church was re-dedicated on 7th May 1977. Monthly morning family services started, a girls' club was formed and membership of the Women's Fellowship Club rose to 40. The premises were well used now. A Brownie Pack was formed in 1983 with Mrs Grace Davies as Brown Owl. After Rev Peter Hudson came in 1983, weekly morning services were started. The wooden lean-to was converted to a small classroom, into which 22 squeezed in some weeks, and two toilets were built. As the 1980s continued, both a Mothers & Toddlers club and a Cub pack were started, the Church became involved in Maidenhead Care, the Church membership rose to 27 and over 100 attended the Church on Mothering Sunday! With the expanding youth work, better rooms and facilities were needed, with the decision for outline application made in 1986. In the late 1980s and early 1990s, the Church was vibrant with Sunday School, Youth Group, a Guide Company (formed in 1987), Brownies, as well as the Playgroup (which became a Church sponsored group in 1988). The Mothers & Toddlers club and the Ladies Friendship Club continued. Most of these activities were lead by members from the Church. 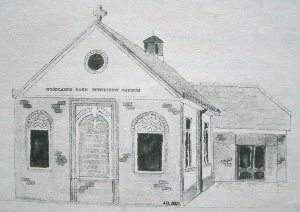 Family and Parade services were held regularly at Woodlands Park School hall, as the numbers were too many for the Church. Indeed, over 100 adults and 60 children attended the December Church service in 1987. 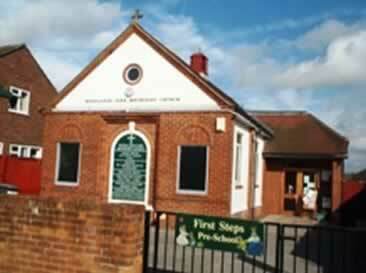 In 1989/90 the Church was extended with the two back rooms added and the lobby area revised. 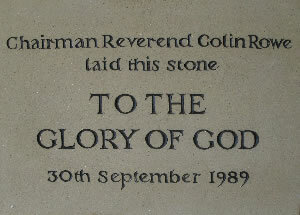 The Chairman of the District, Rev Colin Rowe, laid a dedication stone on 30th September 1989. The formal opening ceremony took place on 31st March 1990. The next 10 years saw major development and renovation work, with the "old" Church roof repaired, the Church carpets replaced, and the addition of much needed storage space and a new notice board. The costs were met by a series of fundraising activities, plus grants and support (gratefully received) from the other churches in the circuit. 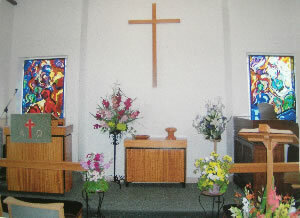 In 1996 when Rev Mary Austin was our minister, changes were made to the area around the altar. A new and extended communion rail was installed, and the area enlarged to enable a steward to assist the minister with the communion services. A large but simple oak cross was made and positioned on the wall above the communion table. The very old wind / treadle organ was replaced in 1988 by an organ from Eton Wick Church. This provided a valiant service for 10 years, but eventually its quality and reliability declined, and it was replaced in 1999. As described above, during the building of the extension, a false ceiling was installed in the Sanctuary. Members decided to "raise the roof", and, in 2000, the false ceiling was removed, exposing the beams. Back to resonant and spectacular Methodist singing! Raising the roof also revealed a small circular window high in the front wall of the Church. 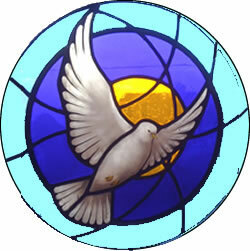 This has now been replaced by The Dove of Peace, a simple, stained glass window depicting the Holy Spirit. Morning sunlight streams through the window sending a coloured beam visible at the rear of the Church. Throughout the year, the changing position of this coloured light indicated the passage of the seasons. 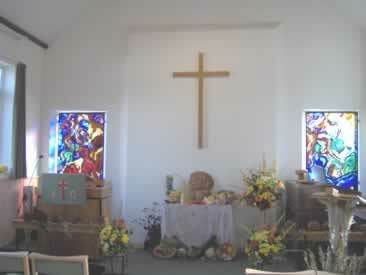 Windows are a feature of this Church. Two large Stained Glass Windows were commissioned by Mr David MacLoughlin as a gift in memory of his sister. The artist, Andrena Lockyer, completed them in 1990. The left hand window takes its theme from Genesis: And the evening and the morning were the first day. It is represented by darker colours, in contrast to the lighter shades on the right hand window, as evening gives way to morning. The second theme is from Psalm 24: The earth is the Lord's and the fullness thereof; the world and they that dwell therein. 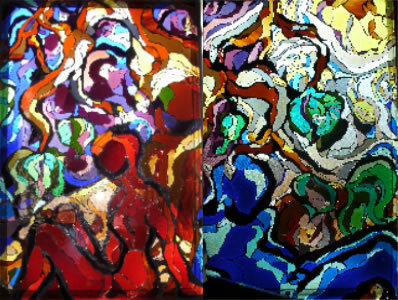 The vast variety of shapes and colours depict the life forms of creation, with an outline of a male form in the left hand window, a female in the right. Also noteworthy, although the windows appear to be stand-alone, they comprise one picture when placed side by side. The darker colours are in the left hand window, so that the brightness of the morning sunshine is diminished to enable a sharper view of the preacher! Over the years Woodlands Park Church has continued as a centre of worship, witness and work for the local community. Membership of the Church has changed, as have some of the Church activities. In 1942 there were just 3 members, in 1972 this had risen to 17, with the membership reaching its peak of 42 in 2004, though numbers have reduced since. Looking forward, the congregation has a desire to maintain a visible presence within Woodlands Park, aided by the Circuit, which is committed to supporting and building up the smaller churches. Only God knows what the future has in store for this Church and its members, who look back with gratitude for past blessings received, and dear companions along the way of faith and discipleship. We pray with them that they may continue to trust in God's goodness and guidance for the future, whatever that may be. And trust him for all that's to come. Joseph Hart, Singing the Faith, 66. A History of Woodlands Park Methodist Church, as set out in the Dedication & Thanksgiving Service, led by Rev Peter Hudson, on 31st March 1990.